Re Walmsley: Two first places finishes in a year (and one big fat DNF) does not a legend make. Sorry, can’t agree with this one. *cough* Two. And quality over quantity. 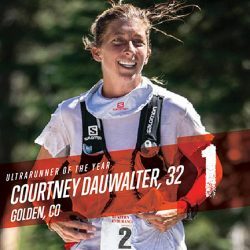 2 races and he is the ultrarunner of the year? He broke 1 record. so no one else in the top ten on the list was even close? I can’t believe he got #1 with only 2 finishes. Sure, he won Western and set a CR, but with the likes of Jeff and DB I think they had overall much stronger seasons. Even RK had a stronger year. Quality over quantity. Both of Jim’s CRs were legendary, and he beat two of the others in this top 10 list by almost half an hour in a 50 miler. The fact that he didn’t go out and smash a bunch of 50Ks is irrelevant. agreed, also he didn’t get the chance to race at TNF 50 which would have given him a fuller portfolio. What’s wrong with only two finishes? Most top marathoners do only two marathons a year. No need to perpetuate overracing. This is quibbling, but how do we deal with a race like Big’s that doesn’t have gender categories? That is, according to the race itself, she didn’t win, because only one person can. But by our broadly agreed upon dichotomy, she did. Deserving of UROTY in any case, I just think this is interesting. Maybe rename this to American Ultra Runner of the Year. Walmsley is super talented. But come on, Browning had an amazing season. 5th at Westerns and 1st at Hardrock in a 3 week span! Not to mention JB has only had ONE DNF his entire career of one hundred Ultras. With all that can go wrong in an ultra race, that’s simply incredible. He’ll grind out a finish no matter how it might affect his Ultrasignup score, unlike other athletes. He deserves UROtD (Decade). They do take in the competition level of the field and Hardrock was not competitive this year so they most likely didn’t give them enough points. Agree with the sentiments here. Browning had a much more impressive season both in wins, number of events and difficulty of races. Respect and admiration to Walmsley, but to me, it’s not even close. Two races. Two epic performances. Yes, the others on this list had great years. Can you name the other males who had two results as incredible as Walmsley’s? I didn’t think so. Case closed. Solid FKT efforts as well. He did the WS/HR/RRR trifecta in 2016 and 2018, which is impressive just due to the volume raced in less than 3 months – not to mention his results. In 2016 he placed 3/4/4 in those compared to 2018’s 5/1/3. The 2018 results are better in terms of standings, but he ran faster across the board in 2016. Of course there are whether, trail conditions, quality of field, etc. to consider. Even so, measuring his course performances against themselves, his 2016 results were better (and none of them set course records). Was he more consistent than Walmsley? Yes – JB is the archetype of a seasoned vet & has arguably been unmatched in this regard. 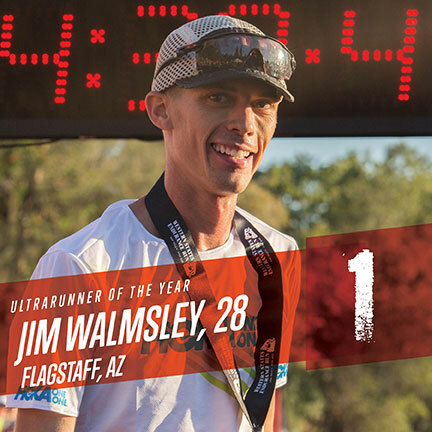 On the other hand, Walmsley threw down record breaking performances at two very competitive, high-profile races. Sure it’s only two performances in Walmsley’s season, but you have to also consider the range. 50 & 100 are very different races at that level, and I think you have to take that into consideration. As someone else said, he had no control over the third race in his season (TNF) getting canceled – another high profile race with a stacked field. It’s interesting going back and looking at the last winner (which means going back to 2015 or earlier to see a different name in the 1-spot). 2015 – Laney gets two wins (Bandera 100K and Chuckanut 50K – neither was a CR), a very impressive 3rd at UTMB, 8th at WS100, 12th at IAU Trail Championships, and a DNF. I’m not taking away from those results, but it’s two wins at significantly less competitive races than WS & LS50. If you pull UTMB from Laney’s results, I think it’s safe to say he’s not taking the 1-spot from Ian Sharman who won 2 competitive 100s, a 50K, and beat Laney outright at Western. They even note in the standings that Laney’s 3rd at UTMB is the best ever performance by an American at that race – so clearly it’s pulling a lot of weight. Point is, a really impressive ‘all-time’ performance at a super competitive race is worth a lot when you look at these lists. Jim set two course records that, at this point, are pretty untouchable. In my mind it’s hard to argue with that. Great of the jury that not one special strategy is needed to get this reward. You just have to be great! To compare different races and achievements is always subjective, but it’s still fun and interesting. Congrats to Jim & Courtney!